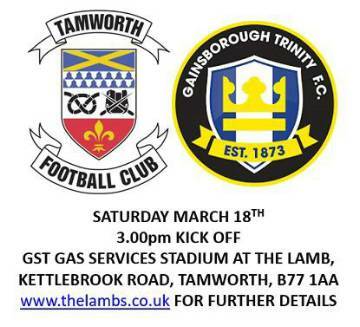 Trinity head to The Lamb on Saturday! We return to home action this Saturday, as we look to bounce back from a late defeat last time out against FC United of Manchester. Despite some disappointing away results, home form remains strong at present, and we currently sit on three consecutive home wins. The reverse fixture earlier this season saw us blow a commanding two goal lead, and eventually lose out by the odd goal in five. It was a happier story last season though, as goal from Elliott Durrell and Steve Tomassen secured a 2-0 away victory, while the scoreline was repeated at The Lamb, Dan Preston and Ross Dyer on the mark on that occasion. Recent signing Callum Powell, along with the likes of Jed Davies and Reece Styche will be aiming to impress in training this week as they look break into the starting eleven. Two player who will not be involved are U21 prodcuts Aaron Opoku and Kai Davis. The young due have headed out on temporary moves to gain further first team experience, with Stafford Rangers and Barwell their respective destinations. As always, tickets start from as little as £12 for adults, £7 for concessions, and just £2 for juniors. We need as much support as possible to help us try and secure the victory!